Over the snow, the world is hushed and white. But under the snow exists a secret kingdom of squirrels and snow hares, bears and bullfrogs, and many other animals that live through the winter safe and warm, awake and busy, under the snow. Discover the wonder and activity that lies beneath winter's snowy landscape in this magical book. Kate Messner is the author of the E. B. White Award-winning The Brilliant Fall of Gianna Z. She lives in Plattsburgh, New York. Christopher Silas Neal is an award-winning illustrator and author who regularly contributes to the New York Times, The New Yorker, and creates book covers for various publishers. He has directed short animated videos for Kate Spade and Anthropologie and was awarded a medal from the Society of Illustrators for his work in motion graphics. He illustrated the acclaimed picture books Over and Under the Snow and Lifetime, both of which explore the natural world. 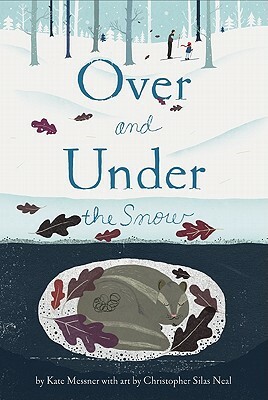 Over and Under the Snow, with author Kate Messner was praised for its "stunning retro-style illustrations" (New York Times), was a 2011 New York Times Editor's Choice and won an E.B. White Honor Award in 2012. He recently contributed art to New York Times Best Seller, Goodnight Songs a collection of poems by author of Goodnight Moon, Margaret Wise Brown. Neal's self-authored book debut "Everyone" will be published by Candlewick press in 2015. He exhibits drawings at galleries and speaks at events around the world. He currently works and lives in Brooklyn and teaches Illustration at Pratt Institute.